In August 1940 Leon Trotsky, one of the architects of Bolshevism and the Russian Revolution, was assassinated in Mexico City. It was the second attempt on his life in less than three months. The assassin, a Spanish Communist named Ramón Mercader del Río, received his orders directly from Joseph Stalin. Stalin had banished Trotsky from the Soviet Union in 1928, but Trotsky continued to write harsh criticism of the revolution’s direction under Stalin’s increasingly tyrannical regime. In 1936, in one of Stalin’s first show trials, a Soviet tribunal tried Trotsky in absentia for treason along with sixteen other high-ranking Bolsheviks arrested by the secret police. All were sentenced to death and all but Trotsky were summarily shot. Four years later, in Mexico, Mercader, who claimed to be a Belgian named Jacques Mornard but also used a Canadian passport with the alias Frank Jacson, gained Trotsky’s trust by forming a relationship with his secretary. On August 21, while Trotsky worked at the desk in his library, Mercader plunged a sawed-off ice ax into his skull. Despite the blow Trotsky lived until the next day. Apprehended by Trotsky’s bodyguards at the scene, Mercader spent the next twenty years in a Mexican prison. From these bare facts Cuban novelist Leonardo Padura has written a fine historical novel that is Russian in scale, spanning much of the 20th century’s experimentation with Communist utopias. 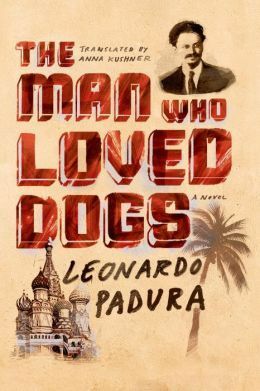 The Man Who Loved Dogs begins in post-revolutionary Cuba after the collapse of the Soviet Union in 1989. Iván Maturell, a self-censored writer who works as a proofreader for a veterinary magazine, tells how he met a mysterious Catalan with two Russian wolfhounds on a beach outside Havana in the late 1970s. Over the next few years, in intermittent encounters, the eponymous man who loved dogs relates the life story of Trotsky’s assassin. In alternating chapters Padura moves three separate stories forward until they collide: that of Trotsky’s wandering exile in Kazakhstan, Turkey, Norway and finally Mexico, where the Communist painters Diego Rivera and Frida Kahlo persuaded Mexico’s leftist president, Lázaro Cárdenas, to accept the unwanted revolutionary; that of Mercader’s journey from the trenches of the Spanish Civil War to the Soviet Union during Stalin’s purges, then to France and Mexico in pursuit of his target; and finally, that of his depressed narrator, Iván Maturell, who occupies the terrible days of economic crisis in Cuba after the Soviet collapse with his compulsive desire to uncover the truth about the story the man on the beach told him. Padura spent over ten years conceptualizing, researching and writing this novel, and it shows. The book breathes life into the character of Trotsky—a zealous, ruthless revolutionary who rues the destruction of his life’s work at Stalin’s hands. It makes real the transformation of a young, unthinking ideologue-soldier into a hardened assassin of Stalin’s secret police. And it is rich in describing the complex political currents facing Europe in the 1930s as two violent ideologies—Fascism and Communism—ripped Spain apart. Today, the house where Trotsky lived in Coyoacán—an affluent suburb of Mexico City—is a museum. Trotsky’s study has been left much the way it was on the day he died, with his wire-rimmed eyeglasses, pages of correspondence and books in Russian and other languages on the table. 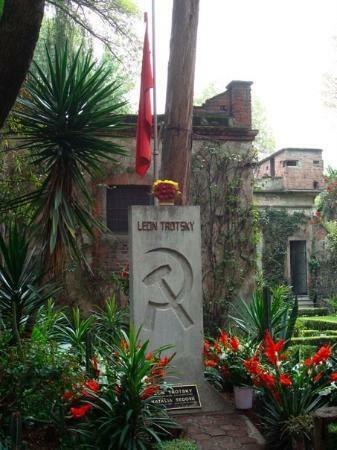 Outside, in a courtyard garden surrounded by high walls and protected by a guard tower and steel doors, a stone monument bearing a hammer and sickle marks Trotsky’s grave. Trotsky’s ashes lie beneath a monument in the garden of the house in Coyoacán. In the background, the guard house on the walls that failed to protect him from his enemies. 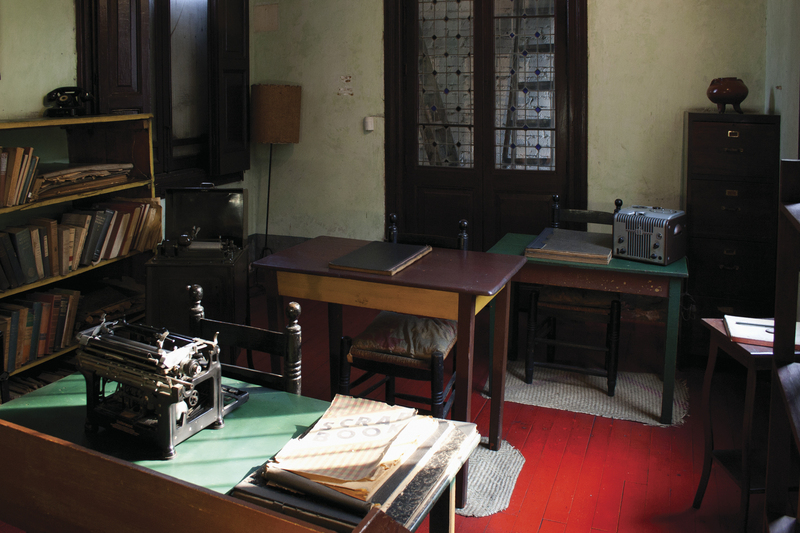 Photo credit: Museo Casa de Léon Trotsky. When I visited the museum on a cloudy, humid summer day in 1976, there was an oppressive atmosphere to the place; it felt more like a prison than a sanctuary. I remember thinking Trotsky’s life in Mexico would make a fascinating story. Padura, visiting the museum in 1989, had a similar thought, and he turned out to be the perfect writer to pull it off. Having lived through the Cuban Revolution, he knew firsthand the optimistic fervor of its early days, when Cubans embraced the great utopian dream of Communism espoused by Fidel Castro and Che Guevara. Padura also saw the gradual corruption of the dream and its decline into diminished freedoms, increasing authoritarianism and hopeless poverty for all but the elite few. In the October 23, 2013 issue of the New Yorker, Jon Lee Anderson wrote an insightful article about contemporary Cuban literature that highlighted Leonardo Padura. Since the Revolution, most Cuban writers have either had to write dull, non-controversial books in order to pass the censors or see their books banned. Padura was the exception. By devoting himself to detective novels, he managed to slip social criticism into his fiction elliptically, avoiding the ire of the state. This made him one of the most popular writers in Cuba. The Man Who Loved Dogs is his most openly critical book, and although he won a national literature prize for it, it’s noteworthy that, after years of skirting trouble in Cuba, Padura now lives in Berlin. If there is one history lesson from the 20th Century that echoes throughout Leonardo Padura’s important novel, it is this: Any ideology—political, religious, or economic—that must compel people to change their behavior in order for the system to succeed inevitably becomes abusive, corrupt and cruel, and is inherently doomed to fail. All three of Padura’s protagonists love dogs but only one, his questioning Cuban narrator, shows any compassion for his fellow man.